Di Rita: Good afternoon. We are reminded all too often of the sacrifices that Americans are making in the global war on terror, coalition partners in general, and certainly none is more precious than the lives that have been lost. But as the president said, their cause is just, and it serves the nation's vital interest. In many cases, forces have been killed or wounded because we continue to take the fight to the enemy -- an enemy that does not want what most Iraqis want: to live in peace and free from tyranny and from terrorism laced with weapons and techniques of mass murder. We've had notable success in rooting out that enemy. Last week, of course, the deaths of Uday and Qusay Hussein were of particular note. But there has been much more. General Sanchez spoke in some detail last week on this point. General Odierno, I believe, on Friday provided some context in his particular area of operations, area of responsibility. 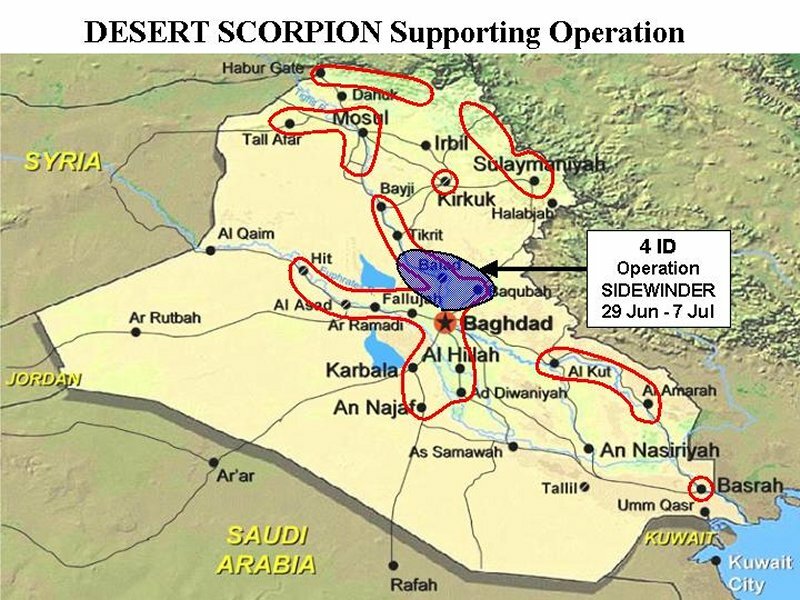 And today we thought it would be useful to zoom out a little bit, give some context to those significant operations that we have pursued since the major combat phase of this conflict in Iraq ended some -- nearly 12 weeks ago. When the president spoke early on about the global war on terror, he emphasized that we will prevail in this war through the patient accumulation of success. There has been significant accumulation of success in Iraq. Hospitals are open. Schools are in session. A national and many regional and municipal governing councils are in place. On the military side, there are equally significant gains, and then we'll discuss those today. We have with us today General Schwartz, Lieutenant General Norty Schwartz. He's the director of Operations for the Joint Staff. I'm not sure that he's had the great pleasure of being down here before. He's the guy who makes General McChrystal look so good on a day-to-day basis when he's down here. So I've asked General Schwartz to provide a little bit of context on the operations that have taken place since the major combat phase. And with that, I'll ask General Schwartz to take it away. Schwartz: Thank you, Mr. Di Rita. As he indicated, I'm Norty Schwartz, the director of Operations for the Joint Staff, and I am happy to be with you here today. I'd like to summarize the military operations that we've conducted since the end of major combat phase in Iraq. (To staff.) 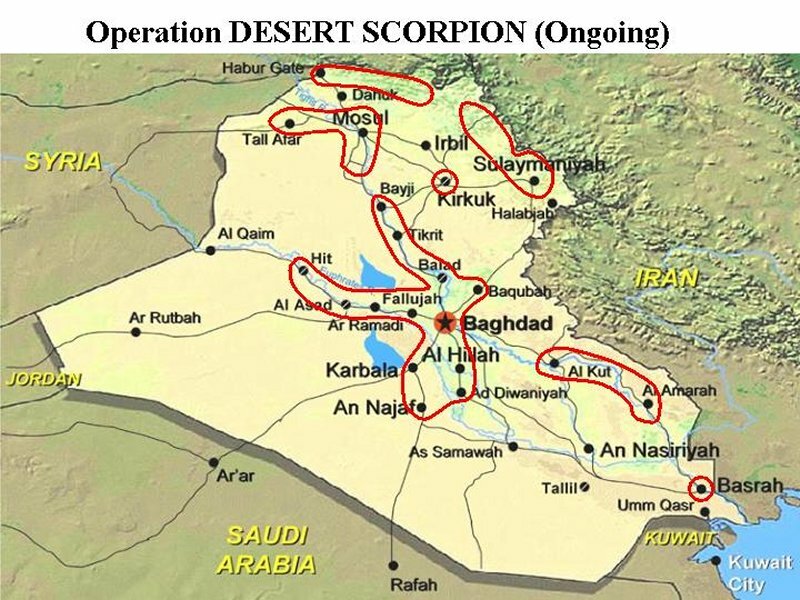 If we'll go to slide 1, please, on the map you can see Operation Desert Scorpion highlighted. 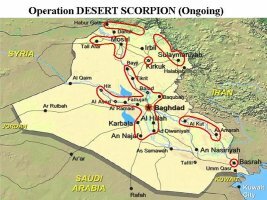 Operation Desert Scorpion is ongoing. To date, coalition forces have conducted six raids, capturing 29 detainees. We've captured $8 million, U.S.; millions of Iraqi dinar; and substantial sums of British pounds and euro currency. The 1st Armored Division in Baghdad also conducted seven raids and captured nine detainees. 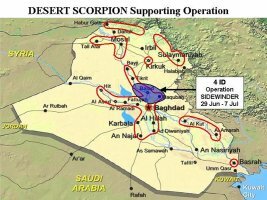 One of the supporting operations under Operation Desert Scorpion is called Operation Sidewinder. During Operation Sidewinder, the 4th Infantry Division was tasked to secure Highway 1 and 2 north of Baghdad from Ba'ath attacks against coalition and other civilian traffic. This mission concluded on the 7th of July. During Sidewinder, U.S. forces detained 282 individuals, seized 96 small arms, three heavy machine guns, 217 rocket-propelled grenades, 200 60-millimeter mortar rounds, and other military equipment, documents, weapons and ammunition. 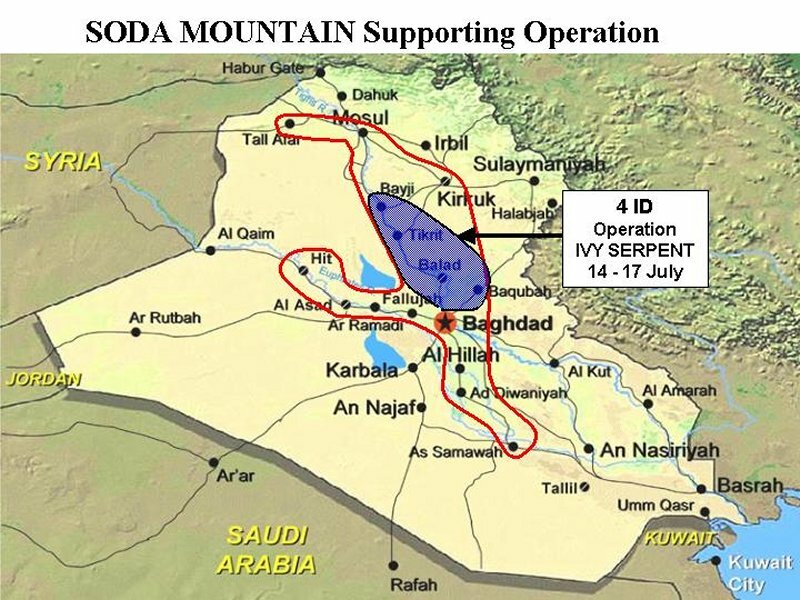 The second major operation was Soda Mountain, which concluded on July 17th and which includes the ongoing sub-operation called Ivy Serpent. 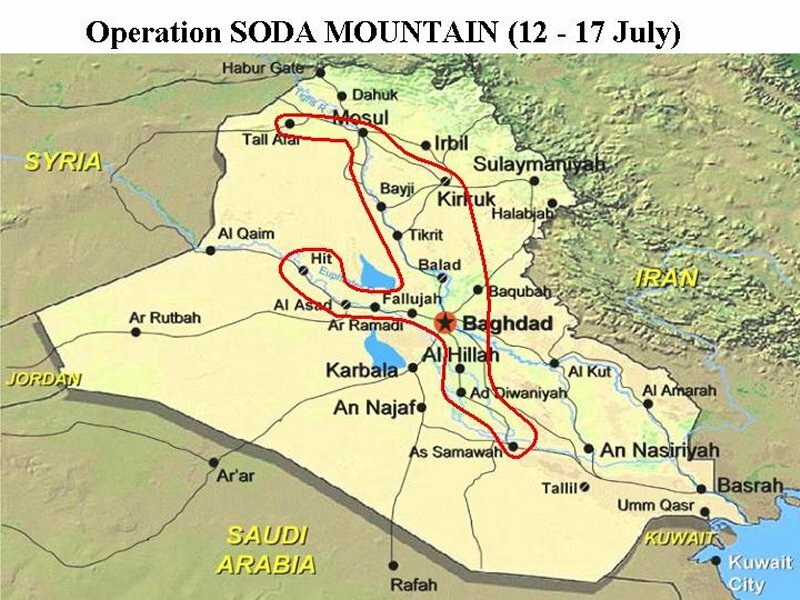 Soda Mountain's mission was to increase reconnaissance and presence throughout the whole of Iraq to deter, disrupt and rapidly defeat attacks on coalition forces. During Operation Soda Mountain, we conducted 141 raids, resulting in 611 individuals captured, including 62 former regime leaders. We captured 4,397 mortar rounds, 1,346 rocket-propelled grenades, and 635 various and in sundry other weapons. 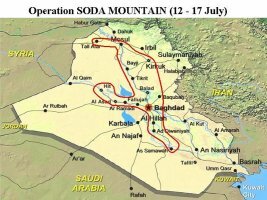 Under the Soda Mountain sub-operation, Ivy Serpent, coalition forces have conducted 27 raids, captured 226 detainees, 800 82- millimeter mortar rounds, 50 small arms and 26 rocket-propelled grenades. Schwartz: You will get a fact sheet afterwards. Schwartz: Six of the detainees captured are former regime loyalists. In summary, these major operations, as well as the daily patrols and training and assistance that our forces perform each and every day, are slowly but deliberately building a more stable and secure Iraq. The coalition is working with Iraqis to improve internal security in the country as well. Four thousand Iraqi militiamen will be trained by our forces in next several weeks and will work under United States command in regions around the country as part of the civil defense force. New Iraqi army and Iraqi police forces are being trained by -- and equipped by the coalition as well. Twelve thousand Iraqis will be trained this year for the new Iraqi army, growing to 40,000 in two years. As for police, soldiers of the 101st Airborne Division continue to train police officers at academies throughout the Mosul area. On Saturday, for example, 60 police officers graduated and will now serve as the cadre for that future academy. Military police from the 1st Armored Division began a training of a second class of Iraqi police officers on Saturday as part of the training integration program in Baghdad that currently includes some 200 officers. Once the program is fully operational, more than 4,000 Iraqi police will have completed the course. The soldiers from the 101st began training a new class of officers for the Iraqi Facility Protection Force, which provides security at power plants, water treatment plants and other public works facilities that provide essential services to the Iraqi people. In the last 48 hours, coalition forces conducted nearly 2,000 patrols, 900 night patrols, as well as over 100 day and some 140 night patrols conducted jointly with Iraqi police. They also conducted 30 raids. In total, these raids have resulted in 241 arrests for various criminal activity, from car theft to murder, and demonstrate that law and order are gradually being restored in Iraq. That said, these successes do not come without cost. I send my sincere condolences to the families of those courageous service men and women who have lost their lives in order to liberate the Iraqi people, and we share the pain of those who have been wounded. We'll now take your questions, ladies and gentlemen. Q: Larry, the Defense Department today terminated the Policy Analysis Market after it had come under sharp criticism from some members of Congress. What were the reasons for terminating this program? And why did the Defense Advance Research Project Agency allow it to proceed as far as it did before it was dropped? Di Rita: Well, you're right, the director of the DARPA has agreed to terminate the program. I would, I guess, just better refer you to him, and we can get some more information. They've evaluated competing requirements for resources across a broad front of programs that they're looking at, programs that are in large part focused on counterterrorism activities, and the director has determined that this is a program that, under further scrutiny, probably doesn't deserve continued support. Di Rita: What I understand -- and I really don't think we'll have much more to say on this point because the program's been terminated. But what I do understand is whatever procedures are in place to evaluate these programs, as DARPA starts to look at whether or not it's the type of program worth supporting were followed. But I just -- there's really -- I don't think I have much more to say on that. Q: -- we go back to John -- just one more follow-up. We go back to John Poindexter again, who apparently had his hand in this program, as he did in one often called, you know, "big brother" about the computerized thing. Is he still on the payroll? Di Rita: At the moment, Admiral Poindexter continues to serve in DARPA. As you know, the Total Information Awareness Program, we've established a number of internal and external safeguards. We've briefed those extensively up on the Hill. We're going to continue to evaluate those kinds of programs with respect to the protections that are necessary as we conduct this kind of really cutting-edge research for counter terrorist activities. But we have established an external review board for those kinds of things, and we'll continue to do that sort of thing. Again, I just don't think I have a heck of a lot more to offer on this. So if you've got another subject, I'll take it. Q: Do you have -- do you have Saddam Hussein? Schwartz: The short answer is I have no information on that. No. Q: That's not a very clear answer, with great respect, sir. Q: You have no information on Saddam -- if you -- you have no information on whether the U.S. government has Saddam Hussein? Schwartz: At this moment in time, that is an absolutely correct statement. I have no such information. Q: Before you walked in here, was there any information to indicate that the U.S. was close to getting Saddam Hussein? Is there any reason to believe at this point that the United States government -- military -- has Saddam Hussein in custody? Q: Can we try it a different way, General? (Laughter.) How -- in recent days, do you feel like you're closing in on Saddam? Can you characterize how that hunt is going? Schwartz: I think it's safe to say that sources are improving. We have people in custody who are providing information. We have walk-ins who are providing information. And we are continuing to pursue those leads. Q: So is it promising? Di Rita: And just -- let me just expand on that briefly, if I can, Bret. As the general discussed in the top of his comments, we've begun to focus our activities in the areas that were identified on the map. General Abizaid has spoken to the importance of focusing intelligence on mid-level Ba'athists who will provide additional information. We had people that walked in that, indeed, did provide that information in the case of Uday and Qusay. And that kind of -- again, we're gathering more people who are providing more information, and as that develops and as we have things to discuss and announce, we certainly will. But at the moment, there's nothing more to offer on that. Q: I believe in an interview yesterday, Deputy Secretary of State Armitage said that he was getting information -- I presume from this building -- that Saddam Hussein was moving around every three or four hours. Is that accurate? And do you feel confident that that's what's happening? Schwartz: I think that is what we believe to be the case that he relocates repeatedly during the day and during the night. Q: And is this something new since the deaths of Uday and Qusay? Or you believe for months he's been changing locations every three or four hours? Schwartz: This is his standard modus operandi. Di Rita: What's new is what we've talked about, and that is we're getting more intelligence; it's getting better all the time. But there's -- I wouldn't read too much into someone's assessment on whether it's 24 hours or 12 hours or 48 hours, because those, to some significant degree, are subjective. Q: Okay. But what I'm trying to say here is that since the deaths of Uday and Qusay Hussein, you haven't seen anything more significant in terms of Saddam Hussein's movements? This is nothing you're tracking every three or four hours and just missing him every three or four hours? Schwartz: I think the bottom line is that we are continuing to pursue leads, as I indicated. And I don't have much more fidelity than that. Q: Well, since the deaths, however, of Uday and Qusay, there have been repeated statements from U.S. military troops on the ground in Iraq that, one, the U.S. military is getting close to Saddam Hussein, and two, he's running out of hiding places. Is it your assessment that the U.S. military is getting close to Saddam Hussein or that he's running out of hiding places? Schwartz: Again, I think we should not focus excessively on Saddam Hussein here. He is a high-value target, of course, of great interest. But the bottom line is we're continuing to develop information and we will pursue that information as it comes in. And do I believe that we will ultimately apprehend Saddam Hussein? I think that is the case. Q: General, last week, some Iraqis felt a little cheated that his sons had not been captured rather than killed because they felt they could have been brought to trial and so on. Does the Pentagon have a preference: capture or kill Saddam Hussein? Is there one that you're trying harder to do, that the troops have been told to try harder to do? Schwartz: This is a decision that's taken on the ground. This is a tactical issue. It is a complex matter. It has to do with the character of the target. It has to do with the circumstances. It has to do with the kind of defensive measures taken. And given that array of considerations, the commander on the ground makes a decision on whether it is capture or kill. Di Rita: Well, and let me, if I can, offer one other thought on that. In many cases, it's the subject of the pursuit that makes the decision. In the case of Uday and Qusay, they made the decision not to come out alive, because they decided to fight back. Di Rita: In the case of -- just for context, I think on the list of 55 that people have -- in some quarters, have focused on the most, a large percentage of those we hold -- of those we have captured are, in fact, alive. I mean, we didn't -- I think four of the people that we've -- on that list that have somehow gotten a disposition on are dead. The others are held. And obviously, you want to try and gather as much intelligence as you can by doing just that. Q: Lieutenant General, are you aware of the purported new Saddam Hussein audiotape? And do you have anything more to add on that? Are analysts already looking at it? Di Rita: I saw something on the TV as we were coming down here. That's all I know about it. Di Rita: Just from our friends in the news media. Q: General, have you heard about any decision that's being made if Saddam Hussein is killed? Will his photos -- will the photos of the body be posted across Iraq and will the world see them? Schwartz: I think I'll leave that for Larry to address. Di Rita: Yeah, it's just speculative. And at the time when that -- a circumstance like that might arise, just as we did this time, there were a variety of factors that played into the decision, and we made the decisions that we made -- the secretary made. Di Rita: I can simply say that there will be evaluations made. Q: General, on the question of focusing intelligence on specific targets and areas, I don't know, the 9/11 report that was released last week had some findings about the lack of cooperation or a lack of actionable intelligence in the pre-9/11 period between the CIA and the military. One of the findings said the military was reluctant to do counterterrorism operations, offensive ops, because it was not getting good intelligence from the CIA, not actionable intelligence. Can you give us a snapshot about how things have improved since then that are playing out in Iraq that are allowing you to pick up the ones and twos and threes over there in terms of the high-level officials? Schwartz: I think the evidence is pretty clear that during Operation Iraqi Freedom there was a level of integration, there was a level of collaboration and cooperation that had no peer in my experience. This was between the agency on the ground with our guys, and it was between the agency and people here even in this town. So I would argue that while that might be contained in the report that you mentioned, that our experience during Iraqi Freedom heralds a new era. Q: Is there any evidence that the informant that fingered Uday and Qusay was an intelligence asset that had been nurtured or cultivated over x period of time? Schwartz: You know that I can't address that issue. Q: General, sir, I'd just like to clarify some of the numbers you mentioned earlier. For instance, when you talk about the detainees from Operation Ivy Serpent, you said there's 226. Is that part of the 611 from the broader Soda Mountain operation, or is that in addition to that? Schwartz: That is in addition because that's ongoing. At the moment, we have, oh, roughly 1,100-or-so individuals that are in the category of high-value targets or enemy prisoners of war and that category. We have 3,500-or-so that are in the criminal category. And that gives you a little sense of the context between the two categories. Q: Do you have any idea how many of those have since been released because they were determined not to have intelligence value? Schwartz: Since the beginning of combat operations, roughly 12,000 detainees have been released. It's a substantial number. Q: Just to get back to the questions that were asked at the outset about the market program, the futures program, can we get an answer for the record as to how that process -- how that was approved, who signed-off on it and when? Di Rita: We'll provide that information. I don't have any information on it, but -- yes? Q: Yeah, could we -- you mentioned the Iraqi Facility Protection Force. Is that the same as the Iraqi militia or is it a different group? Q: Could you elaborate on what they're about? Schwartz: Their basic function is to protect key facilities, as I indicated, whether they be water plants or perhaps pipe lines or power plants. Q: How quickly can those folks be brought to bear? Schwartz: There are already 8,000 Iraqis on the payroll for performing those kinds of functions. So it's already under way. Schwartz: We can't talk about the position of the Iwo Jima, except that it is proceeding, according to direction from the secretary of Defense, toward Liberia. But there are a couple of things occurring. There are five assessment teams currently deployed both in Senegal, Ghana, Mali, Nigeria and Sierra Leone to assess what requirements the ECOWAS- contributing nations might have for their battalions to assume duty in Liberia. And those assessments are ongoing, and the purpose of which would be to determine what we might offer to enable them to accomplish that mission. Q: And if ECOWAS says that they would require some U.S. troops to lend some initial assistance? Schwartz: That is a decision that has not yet been taken. That has not yet been decided. Di Rita: It's just too early. I mean, the assessments are ongoing, and it wouldn't pay to really speculate on what the assessments might reveal. And we'll deal with it when they do. The president hasn't decided anything other than what he has, which is to put the -- put some forces a little bit closer to the vicinity. Q: Do you know if ECOWAS troops are on the way? Di Rita: Why don't we just go in order here? Q: Okay. What kind of change in attacks have U.S. forces seen in the few days since Uday and Qusay were killed? Schwartz: We have seen some lessening of attacks overall, as General Sanchez reported recently, but it remains a dangerous place. And I think, significantly, we continue our offensive operations, whose purpose is both to deny and take down those elements which are engaging -- putting our forces at risk. 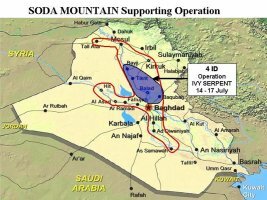 Q: What new information, if any, has turned up regarding the connection between Iraq and al Qaeda since -- new information since the fall of Baghdad or the end of major combat operations? MR. DIRITA: I'm not aware that there's any new. I mean, what we're doing at this point is trying to evaluate the documents that have been -- we've recovered a number of documents. We're evaluating material that was already in hand beforehand. It's -- I don't know that there's been anything new to report on that point. Q: Do we know how many of the ECOWAS troops are heading for Monrovia, and are they on the way, and when are they going to arrive? Schwartz: They are not yet on the way, sir. Schwartz: The assessment is still under way. Q: Would you expect the resistance that you're seeing now to continue once Saddam is either captured or killed? Schwartz: I think that is largely speculative. There will be some disenfranchised individuals who will continue to resist, and we will reduce that resistance. Di Rita: And I think the general assertion or belief is that increasingly, daily it's becoming obvious to Iraqis that this regime is history. And to the extent that we can continue to make vivid demonstration of that, because there will always be people who hold out hope till the very end, that will sort of reduce that pressure to some extent. It remains to be seen. Q: Can I follow up on that? Q: I mean, does this resistance hinge on his leadership? Schwartz: We do not see national orchestration of the attacks that are occurring. So the short answer to your question is that is not a factor. Q: Can I follow up on a couple of those points? While the general said late last week that the number of attacks had been lessening, he also talked about the fact that there was some concern that some of them were getting more sophisticated. And I have two questions related to that. Can you help us understand what is more sophisticated about them, what it is -- what kind of technology, if you will, you're seeing out there. And he also mentioned that you think now you may be dealing with just a handful of Iraqi weapons experts who are doing these and moving around the country. Can you help us understand both those points? Schwartz: Sure. What we've seen is a transition from what began largely as small-arms attacks to attacks with use of rocket- propelled grenades, and now the use of improvised explosive devices. And that reflects a level of sophistication which has matured over time. Now, the point is that we also have witnessed when they do convoy engagements that there has been an increase in the level of sophistication on how one stops or makes the initial vehicle slow down so that one can engage the target more effectively. It is that sort of sophistication at the very tactical level, at the micro-level, that has evolved. Q: Are you able -- can -- are you able to tell us how they're making vehicles slow down, how you're responding to that, and the notion that you're dealing with a couple -- a handful of, perhaps, bombmakers? Schwartz: I cannot comment on the handful of bombmakers comment. However, with regard to vehicle operations, the notion would be that if there happens to be a road, a turn or a -- the design of the road requires vehicles to slow down, that is, perhaps, an ideal location to do an ambush. And it is this sort of sophistication that has begun to develop where we see people using the environment somewhat to their advantage. Schwartz: You discover -- you do tactical reconnaissance to discover where those locations are, and you police those areas. Di Rita: And you also do what we're doing, which is you can't defend everywhere, so you go on offense. And we've been on offense now to some significant extent for quite a while. And those were the numbers that General Schwartz outlined in the beginning. Q: General Schwartz, then will you talk about in more detail what Odierno said last week, which was the attacks are getting less frequent; there aren't as many attacks, but they're more sophisticated. It would seem if they're more sophisticated, if they're killing more Americans, which they have been, that it's sort of irrelevant that these small ones are backing off. It seems like they're getting more organized and, in fact, getting better at it. Schwartz: The fact is that they are getting somewhat more sophisticated, and this is a concern. And so, we have to adapt. And the way we do that, as Mr. Di Rita indicated, is we go on the offense and we engage and we go uncover those locations where the bombmaking material exists. For example, one of the things that you will see is that we have recovered 15,000 pounds of C-4, an ideal item for making improvised explosive devices. Q: And how much of that do you think is in the country? I mean, what kind of dent does that put in it? Schwartz: It has to be a significant dent. Di Rita: I think we have time for maybe one or two more. Q: It was stated earlier that whether someone is taken alive or killed in an attempt to capture him is pretty much dependent on that person. It's that person's decision on how they want to react. So what does U.S. intelligence say about how Saddam Hussein is likely to respond if cornered as his two sons were? Schwartz: I think that's -- that, again, is speculation. I have not read any intelligence reports that suggested precisely how he would react. Our people would be prepared for either eventuality. Di Rita: I mean, it was several months ago now we established a board for the purposes of some of the research being done that people have concerns with regard to protecting personal information and those kinds of things. It was established in view of the so-called Total Information Awareness Program. So we've got -- I was kind of broadening out on the kind of -- some of the research being done is unusual, it's different, it's new, it's got -- there may be people who see this as cutting edge and maybe beyond certain limits that they're comfortable with. So, in order to make sure that we were always going to sort of do things in a way that everybody could be comfortable with, we asked a number of people with expertise in these issues to form this outside board. We announced that, gee, several months ago. Q: And did this program pass through that external board? Di Rita: Well, it wouldn't have necessarily. And I wasn't trying to make a direct connection. Di Rita: I was only speaking to the -- I think somebody asked the question, "How could a program like this even see the light of day?" There's a lot of interesting, unusual and, in some cases, in this case, as it turned out, sort of not worthy research, but research that people at one point sort of thought let's think about this and let's decide if this is worth pursuing. In this case, the director of DARPA decided it was not worth pursuing. But the fact is, because there's sensitivities out there on the kind -- on research that's new -- because we're in a new world -- we establish these protections. And as I said, we briefed these protections significantly. Q: And was the decision made because of the public furor and congressional opposition, or because it was determined it was simply a bad idea? Di Rita: I think I would just refer you to the man who made the decision, and we'll get some information for you on that point. Q: Is that Admiral Poindexter? Di Rita: No, no. The director of DARPA, who is a gentleman by the name of Dr. Tony Tether. Q I thought you said "for the moment," Admiral Poindexter remains at DARPA. So there's no misunderstanding, is that moment going to continue? Di Rita: I don't have anything to announce on that, I really don't. Tony, what have you got? Q: Sir, on the attacks and the U.S. going on the offensive, I just want to put a context on it, kind of equivalent to the war itself. During the war, there were a number of these so-called time- critical targeting attacks, the one after Chemical Ali and one after Saddam Hussein the first couple of days. Are what we're seeing here the ground equivalent of these time-critical targets, aided by intelligence? Schwartz: Clearly, Qusay and Uday was a time critical target. We responded rapidly based on developing intelligence, and we will continue to do that; absolutely. Q: This is the equivalency? Schwartz: Absolutely. The difference between the ground and the air is only the medium. Di Rita: Thanks very much. I think we're about out of time. We'll see you next time.